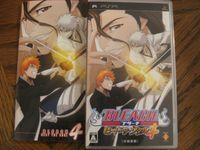 Bleach: Heat the Soul 4 (ＢＬＥＡＣＨ：ヒート・ザ・ソウル４?) is the fourth installment in the Heat the Soul series, released on May 24th, 2007. The game features 51 characters, covering events from The Arrancar arc to the entrance into Hueco Mundo. Unlike its predecessors, Heat the Soul 4 features a "Character Master" mode. In it, the player chooses a character and goes through a series of five battles and is usually faced with certain conditions, such as using only grab to inflict damage, in order to finish the battle. After the third and final battles, a multiple answer question posed by the character must be answered. Depending on the answer, the player is either rewarded 200 points, 50 points, or nothing. For each battle won, a random number of experience points will be added to the character's total. As the level grows higher, bonuses such as voice tests and alternate costumes can be unlocked. The player is also given 100 points per battle; these go towards unlocking more characters and stages.